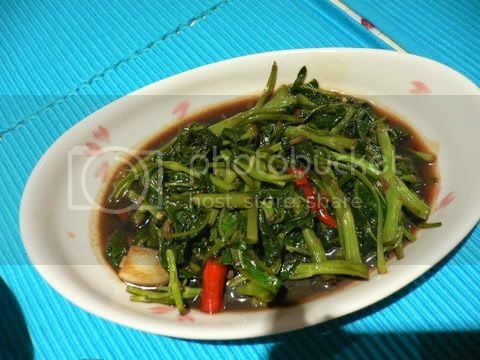 Made KangKong (Water Convolvulus) with chilli garlic on Monday, 22 May. I always eat this at one of my favourite indian (chinese) restaurant. Couldnt ask them for recipe, so I decided to taste & modify it myself. This is the 2nd time I make this dish. Our vege meals are usually pak choy, eat until abit sian already. Mondays are always Spinneys (supermarket) Market Day. And only that day, I could see fresh, beautiful KangKongs. Bought 2 bunch home and decided to cook this dish. 1. Heat 1tbsp oil in the wok. Add in garlics. Stir fry till fragrant or browned. 2. When garlic is browned, add in chilli padis. Stir fry for 1 min in medium heat. 3. Throw in kangkong, fry & add dark soy sauce, sugar. 4. Make sure sugar is dissolved and kangkong are cooked. 5. Dish out & serve with rice.